Do you ever get the feeling that there is a world of strategic investing intelligence from which you are being excluded? Do you even wonder how much further you could go as an investor if only you were familiar with the tactics and tools used by the real front-line market strategists and the professional money managers? Well, stop wondering, because in Lessons from the Front Line a leading financial reporter reveals the secrets behind the tactics of today's most successful money managers. For over a decade, Michael Brush has been covering the markets for the New York Times, the Economist Group, and Money magazine. During that time he has interviewed many top money managers, listened to their war stories, and observed them in action. In follow-up interviews with these managers for this groundbreaking book, he develops what he's learned into 21 powerful lessons for smart individual investors, traders and day traders-lessons you won't find anywhere else. 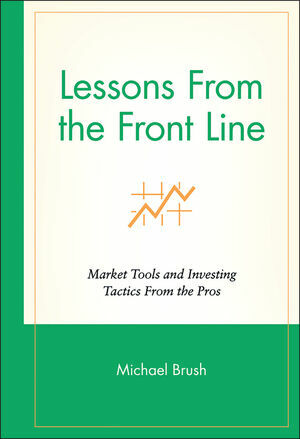 In a series of concise chapters, liberally peppered with quotes by leading money managers, analysts, and academics, Brush describes how the pros develop investor intelligence, exploit stock market patterns, make use of advanced investment tactics, and manage crises. A stock-picking guide for today's new breed of savvy investor, Lessons from the Front Line arms you with the professional tools you need to dramatically increase your profit and performance. MICHAEL BRUSH has written about business and investing for the New York Times, the Economist Group, and Money magazine. He studied business and economics at Columbia Business School and Johns Hopkins University School of Advanced International Studies. The Wall Street Analyst's Report. How to Participate in Your Company's Conference Call. Reading the Insider Tea Leaves. The Price to Sales Ratio. Cash on the Balance Sheet. What the Economic Indicators Really Mean. The Basics of Biotech Investing. What to Do When Your Stock Blows Up. When Good Stocks Go Bad.